There is a fifth dimension beyond that which is known to most managers. It is a dimension as vast as space and as timeless as infinity. It is the middle ground between art and science, between the qualitative and quantitative and it lies between the pit of a manager’s fears and the summit of their knowledge. 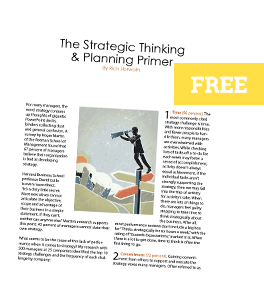 That’s the signpost up ahead–your next stop, the Strategylight Zone. The place: a company, any company, maybe yours. The situation: a working session between two managers preparing for tomorrow’s strategic plan presentation. Well, what would you do? For many well-intentioned managers, this episode of the Strategylight Zone is all too real. Research published in the Harvard Business Review showed that 43% of managers couldn’t state their own strategy and 67% of managers believe their organization is bad at developing strategy. Both of these dismal numbers may be in part due to the fact that only 19% of managers say their companies have a distinct process for developing strategy. [Rod Serling voice over:] Two managers holed up in a third floor conference room the night before a strategic plan presentation. Will the plan be a useful tool to drive their activities throughout the year, or is it simply another dog-and-pony show to appease senior management? Tonight’s tale, from the Strategylight Zone.